It's amazing how one simple line can resonate in your heart and truly transform life. It's even more amazing when it comes from a tiny 3 year old. This song is by Moriah Peters. She came to kamp this summer and we got her CD before she arrived to hear her stuff. Well, it was great. After kamp I put her CD in our swagger wagon (minivan) and the littles and I would listen to it. After a week of her CD, our 3 year old started asking for her "Jesus song." Mommy translated that into her meaning this song...imagine a precious 3 year old singing..."I choose Jesus, from now to eternity..."
After I was so overwhelmed by my 3 year old the song became my anthem when I awoke, when I was impatient, when I felt anxious, when I wanted to choose other things but Jesus...3 words...I CHOOSE JESUS. 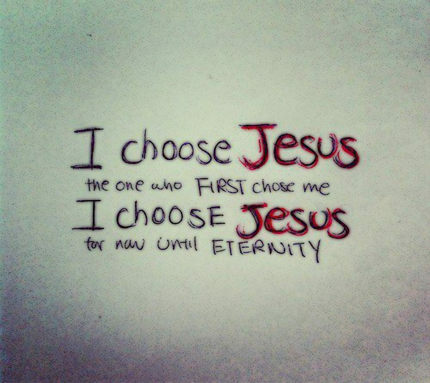 Who are you choosing in your life?